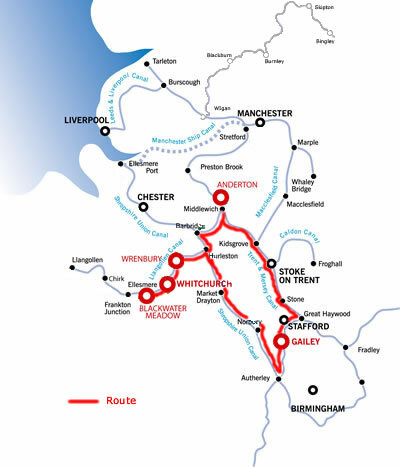 From the Llangollen and Shropshire Union Canal through the rolling Cheshire Plains to the Trent & Mersey Canal, the Staffordshire & Worcester Canal and back via the Shropshire Union the Four Counties Ring is one of the more rural Cruising Rings and is best savoured slowly. Turn left out of the marina & and soon you will see why this area is known as the mini Lake District, as you pass some of Ellesmere's Meres (lakes). The largest mere is off to the north just before Ellesmere Tunnel, but after the tunnel you pass the small Blake Mere, then off to your right is Cole Mere. The Meres were carved out during the Ice Age. You can moor up for refreshment after a couple of hours cruising by Halls lane bridge 12, and take the track to Ravensmoor where you will find the Farmers Arms serving real ale & meals. Turn left at Hurleston junction onto the Shropshire Union Canal, you will follow the reservoir for a short while. At Barbridge you reach the junction of the Middlewich branch of the Shropshire Union, turn right here and follow the Middlewich branch of the Shropshire Union Canal. This canal is an attractive and under rated canal with some wonderfully tranquil moorings. There are no villages and no pubs until you reach the town of Middlewich with only 3 locks along the way until you reach the Middlewich junction where the Wardle Lock takes you onto the Trent & Mersey canal. The Church Lawton Locks ascend from Rode Heath, these locks are perhaps the nicest along Heartbreak Hill, set among woodlands with stunning views towards Mow Cop Castle, particularly lovely on a balmy summer evening. There are actually two tunnels running parallel under Harecastle Hill, the first was built by James brindley, there were many problems with the construction of the tunnel, it took eleven years in total to build, by which time brindley had passed away. At the time of its construction the tunnel was twice the length of any other tunnel on the network. The narrow tunnel became a bottleneck for boaters, so some sixty years later Thomas Telford was employed to build a second tunnel and the two tunnels were used until the early 1900's when brindley's tunnel was abandoned. Telford's tunnel is still in use to this day, there is a one way system in place, and passage is controlled by tunnel keepers at either end. You can still see the closed entrance to brindley's tunnel although you can't approach it in a boat. You may well see the Kidsgrove Boggart on your journey through the Harecastle Tunnel, this is rumoured to be the ghost of a young woman who according to legend was decapitated and her body thrown into Gilbert's Hole, a coal landing stage within the tunnel. She is now said to haunt the tunnel appearing as either a headless woman or a white horse. Local miners used to believe that if she was seen it was a warning of a forthcoming disaster in the mines. There is, however, no record of any such murder taking place, and it's possible that the story may havebeen inspired by similar tales from Crick Tunnel on the Grand Union Canal or Rugeley which is also along the T&M. 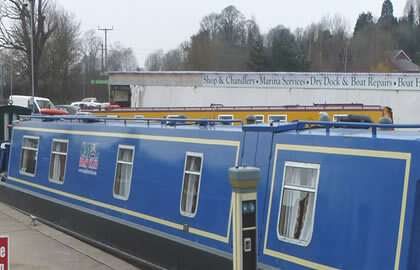 The Wedgwood Visitor Centre is just after Trentham Lock and is accessed from bridge 104. The Wedgwood Group is the largest china & earthenware manufacturer in the world. It was started in 1759 by Josiah Wedgwood, he built Etruria and he used the canals for transport. The museum at Barlaston has a vast range of exhibits of Wedgwood pottery. The new £4.5 milion visitor centre is open every day. There are demonstrations, a shop, museum, bistro & a restaurant. Moor for the night near bridge 103 in the village of Barlaston. There is a Pub here. It is 7.5 hours cruising to here. After turning right down the Staffordshire & Worcester canal you find the beautiful surroundings of Tixall Wide which lie just a short distance along the Staffs and Worcs & which are most certainly worth a little exploration. Chillington Hall, close to the village of Brewood (pronounced brood), is home to the “Fancy bridge” named by the workers who built the Shroppie. Powerful landowners demanded grand and ornamental bridges where the canal crossed their properties and this is a fine example of such work. A tree lined avenue crosses the canal here leading up to Chillington Hall which is now a venue for Weddings. Just a short distance upstream from Chillington Hall is Brewood and you will find shops, pubs and restaurants close at hand and there is also a boatyard all of which should meet any of your requirements. Just beyond Brewood you will see the Belvide Reservoir which supplies water for the canal. A very short distance from there is a cast iron aqueduct, the Stretton Aqueduct, which was built in 1832. It is used to cross the A5 Watling Street and take you onwards to Wheaton Aston where you will find the first lock on the Shroppie other than the stop lock at Autherley. The Wheaton Aston lock is unique by way of being the only singular lock on the canal route as the other locks are bunched together in "flights". This made for quicker working by the boat people because locks could be easily prepared in advance of the boats. At Wheaton Aston you will find a waterside garage that offers some useful facilities for boaters and a canalside pub. Wheaton Aston also has a few basic supplies. After departing Market Drayton Shropshire heights before the next set of 5 locks at Adderley. These are a good “warm up” for the Audlem 15, the longest flight of locks on the Shroppie, which are around a mile away. Both sets of locks are set in beautiful settings with gorgeous views. Luckily there are a couple of pubs at the bottom of the flight of 15 locks so a well deserved drink can be enjoyed. The Audlem Locks have a total drop of around 30 metres from the Shropshire heights to the Cheshire Plain. This is another area that is popular with walkers, the towpaths are often busy with people taking strolls on nice days, and there is a gift shop to visit which is in an old mill. Audlem village is another place to get supplies in, just a short walk from the Shroppie, with most shops available along with a tourist information and post office. We now leave Nantwich and find a changed canal, it is more winding and wider as we work our way north, which is more typical of an older canal than the Shroppie. At Hurlestone is the junction with the Llangollen Canal and you turn left and retrace your steps back to Blackwater. It is 16 hours back to Blackwater plenty of time to stop off and explore . Stopping places can be Wrenbury & Whitchurch.